Surface quality is an essential determining factor for both the end product appearance and the component function in manufacturing field. Taking an iPhone OEM factory as an example, more than 30% manpower was consumed on the appearance inspection during the manufacturing process. The inspection manpower cost is up to RMB 4.8 Billion per year. However, with over 10% annualised rate of average wage growth in China, the days of low-cost labour force are gone. Reducing manpower cost has become the most important and urgent problem to be solved for manufacturers. To reduce the burden of the expensive labour force, automatic visual inspection systems employing intelligent image capturing and image processing technologies are in high demand. ASTRI is developing a system level intelligent in-line surface defect visual inspection technology platform for variable characteristics surfaces. The project team is focusing on developing the following IP protected platform technologies, including: 1) Multiple layers transparent surface defects inspection technology, 2) Curved transparent surfaces defects inspection technology, and 3) Mixed characteristics surface defects inspection technology. The above technologies can be widely applied to the inspection of the consumer electronics, of which over 60% worldwide shipments are made in China. Transparent surfaces such as cover glass, touch panel, LCD display are very sensitive to defects. 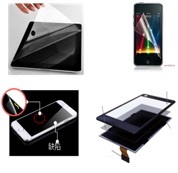 Thus, it is very difficult for the cosmetic inspection system to detect the defect on a transparent surface, especially when several pieces of transparent surfaces are stacked on each other layer by layer, such as the display panel of a mobile phone. It is also a challenge for the defect inspection system when the object to be tested has 2.5D or 3D shape. An image capture system is developed with a single or multiple image capture devices flying on top of the transparent surfaces. The specially designed image capture system contains high resolution 16K line scan camera lens and novel high optical efficiency multiple eagle illumination lights to make all direction defects more visible. The image capture devices can detect various defects, such as scratch, circular defects, zigzag, logo pattern, etc. The system is developed for 2D transparent surface defects inspection. Meanwhile, the 2.5D and 3D transparent surface defects inspection system is under development. Small smart vision devices such as mobile phone cameras, surveillance cameras, automotive safety devices, street and nature observations, etc. can facilitate different aspects of our daily life. Therefore, manufacturing technologies of cheap plastic lenses are in great demand in modern mass production companies. 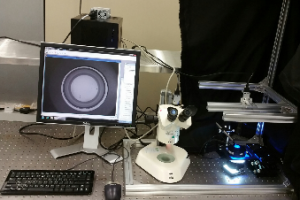 ASTRI develops complete automated systems for inspection of small lenses for mobile cameras and other devices. 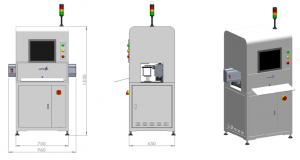 These systems could be included in manufacturing process for automatically rejection of defected samples from further manufacturing procedures, defects statistics collection and their classification. Defect samples may have scratches, bubbles, spots, particles, injection molding deviations, coating defects and so on. • emergent signalling about number of defects in sequence.